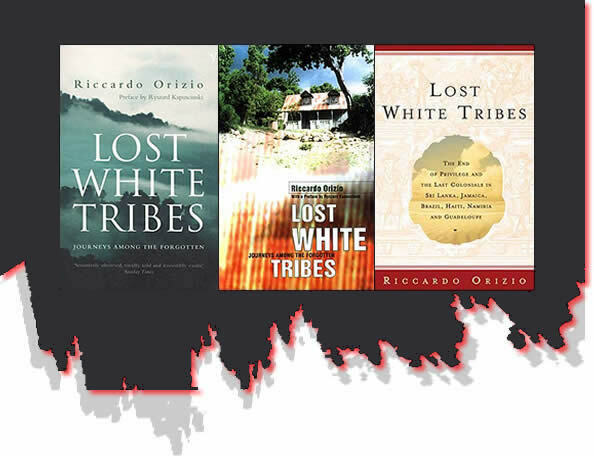 Lost white tribes. These evocative words make up the title of a new book which has attracted attention from London reviewers more due to the fascinated curiosity about the subject than to literary merit - which the book does, in fact, possess. Riccardo Orizio, an Italian journalist, travelled widely in order to write it - as he neatly comments, his work usually takes him to places where important events are unfolding, while this quest took him away from them. He has written of six ethnically differentiated communities, some quite sizeable and others pathetically small and on the edge of extinction, whose ancestors were uprooted from their European countries of origin and who have preserved their identity, though not always their original language, in an alien (usually tropical) land. Three of them once enjoyed relatively privileged economic and social status. The "Dutch" Burghers of Sri Lanka lost theirs after the British left, and the Basters of Namibia (descended from Boer trekkers and Hottentot women) became marginalised after that country passed from South African to Ovambo rule in 1990. The third group are the Confederados - descendants of thousands of Whites who, in the aftermath of the American Civil War, emigrated from the defeated and impoverished southern states to seek a better life in Brazil. They strive to keep their folksy southern ways, and the confederate leader General Robert E. Lee has a quasi-godlike status among them. 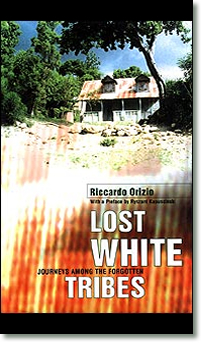 Orizio spent time with the descendants of Germans in Jamaica (I found this chapter forgettable) and - much more sensational - with the Poles of Haiti and the poor Whites of the French Antillean island of Guadeloupe. Haiti is about the poorest and most miserable land on earth, and the remaining descendants of Polish soldiers recruited by Napoleon to put down the Black revolt in 1803-04 scrape an existence in a remote and virtually trackless area; for a time they believed that the Polish Pope, John Paul II, would come to their rescue. The poor Whites of Guadeloupe (which also has rich White planters and merchants) fantasise that they are related to Prince Rainier of Monaco, who they say came to the island to visit them, though there is no hard evidence that this ever happened. They live by growing sugarcane and are best known locally for intermarrying (to avoid miscegenation), which produces many deformed and idiot children. They live in remote mountain jungle, and Orizio remarks on the extraordinary beauty of the habitats of both these communities. One reason at least for the interest in such groups must be the latent fear in many of us tha we might at some time be in the same predicament. Communities and nationalities go to great lengths to assert their collective identity with flags, anthems and propaganda, but how much more so if they feel threatened with the loss of a comfortable way of living. The fall of the Roman empire to the northern Barbarian tribes after centuries of power and glory is a reminder that even the greatest civilisation is not as permanent as it seems, and rulers can become slaves almost overnight. Master-races get exhausted by wars, impoverished by spending their substance on useless things like nuclear weapons, and degraded and weakened from within by self-indulgence. Ricardo Orizio is an engaging writer, sophisticated and sympathetic, and is well served by his translator, but the book, like its subjects, has an identity problem. The introduction states the theme, but is only three pages long. The book has no inner driving force, and the six chapters seem to occur at random. This is purely a travel book, albeit one with a theme of great sociological interest. (Orizio brings his sometimes bizarre informants vividly to life and is a master of relevant detail, but he pads his narrative excessively with background material. I looked for an index and, if not a bibliography, then a page or two about accessible literature on the subject, but neither were to be found. Orizio was obviously determined not to bore his readers, but he succeeds instead in tantalising them. There is no mention of the classic fictional-autobiographical treatment of this theme, The Wide Sargasso Sea by Jean Rhys, or of a well-known actual instance of the phenomenon: the "Redlegs" of Barbados. This still surviving community is descended from English indentured labourers taken to the island to work the plantations before the arrival of Black slaves nearly 400 years ago. Their degraded condition already disgusted British travellers in the early 19th Century, and they have preserved to the present their racial arrogance which prevents them either from marrying Blacks and refreshing their stock or from doing work of any kind, which they regard as only fit for Blacks. (White South Africans coming to Britain for the first time up till the 1950s always had a shock on first seeing "Black man's work", i.e. manual jobs, being done by Whites.) As a result they live in squalor. A very readable scholarly study of them, The Redlegs Of Barbados by Jill Sheppard, was published by KTO Press in the U.S. in 1977.